Katyayani, or Dr Katya Langmuur, is a professional and personal development facilitator, academic, therapist and meditation teacher. With a PhD in the nature of charismatic leadership, coupled with over twenty years’ hands on experience with groups and individuals, she finds innovative and engaging ways of threading behavioural science, psychology, philosophy and ethics into modern ways of living and working. Maybe you’re looking to (re)inspire your professional life through group training or one-to-one supervision or coaching? Or possibly you feel you’d benefit from greater personal support at this particular point in your life? Katya is a one of a kind. She is funny, down to earth, sparky and clever. Just all-round brilliant! I’ve been fortunate to work with a few great teachers, and I can honestly say she is one of them. Can’t make class or want to practice more? 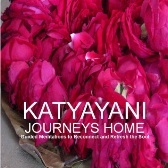 This CD offers an introduction to the practice and two blissful guided sessions with Katyayani set to original atmospheric music by Greg Parker. Suitable for every level of meditator. Cost: £15 (UK P&P is £2.50; international P&P is £4.50). Please email info@katyayani.co.uk with your name and address and details on whether you would like to pay by cheque or bank transfer.